Veronica “Ron” Wilson has her whole life behind her. At least, that’s what she comes to realize soon after waking up in the mysterious house she had come to investigate. A paranormal investigator by trade, Ron now finds herself investigating her own death with the help of a handful of helpful friendly ghosts — and one who’s just a pain in the rear-end. Unfortunately, being dead doesn’t keep Ron from noticing that he also possesses quite the nice rear-end or from tingling in ways that almost make her feel alive whenever he’s near…. As if unwanted afterlife crushes weren’t bad enough, Ron soon discovers that she and her fellow ghosts aren’t the house’s only inhabitants. They’re all at the mercy of an entity named Sarah, who looks like a cute and innocent kid, but is in fact the reason each and every one of them died. Now Sarah keeps them prisoner and makes them her playthings, until she gets tired of them and… well, it turns out you can kill someone who’s already dead. Or at least Sarah can. With the help of her still-living sister, a psychic medium who can talk to the dead, Ron and her ghostly housemates must unlock all of the mysteries that the house has to offer and find the way to defeat Sarah once and for all. Only then will they be free to move on to the other side. But is Ron really ready to go, especially now that she knows there’s a lot of living to do after death? 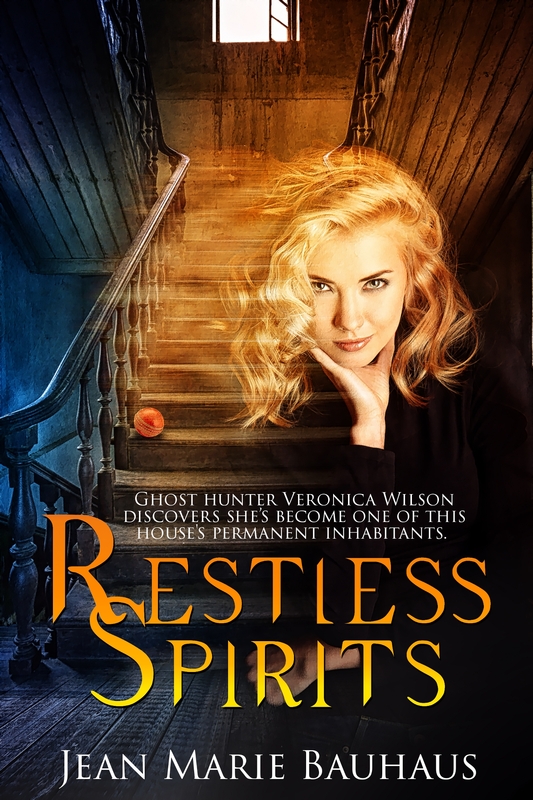 In this standalone novelette set one year following the events of Restless Spirits, sisters Ron and Chris Wilson find a new challenge when a tortured spirit suddenly appears in the house Ron is haunting alongside her ghostly paramour, Joe. After paranormal investigator and medium Chris Wilson buys an antique desk for her new office in the renovated house she shares with Ron and Joe, Ron discovers the desk came with an unexpected bonus: a failed author who died of a heart attack in the middle of a nasty argument with his wife over that very desk. With Chris’s help, can Ron and Joe help this tortured spirit make contact with his wife and find the peace he needs to move on to his final rest? Or will they be stuck sharing their home — and Ron’s ghost-writing space — for the foreseeable future? When crime reporter Derek Brandt paints ghost whisperer Christine Wilson as a charlatain on the nightly news, her sister Ron, an actual ghost, is incensed. Defying her sister’s wishes, Ron takes it upon herself to haunt the skeptical journalist and turn him into a true believer. But Ron gets more than she bargained for when she discovers Derek is already haunted–by the ghost of his murdered brother, Jimmy. After spending years watching over his kid brother with no way to communicate, Jimmy is ready to do whatever it takes to get through to him so he can move on to his final rest. Ron is happy to help, but they need Chris in order to relay Jimmy’s message to Derek. Only problem is, despite all evidence to the contrary Derek is still convinced Chris is a fraud. And after what he did to her reputation, Chris isn’t exactly filled with warm feelings for Derek, either. Can the Wilson sisters help Jimmy break down Derek’s resistance and accept that his brother is still present and in need of help? And can Chris and Derek put aside their mutual distrust for Jimmy’s sake? If they do, they just might find that enemies can turn out to be kindred spirits. When her dad and his annoying girlfriend announce their engagement, Chris Wilson isn’t exactly thrilled. As if getting roped into bridesmaid duty for a future step-mom she can’t stand isn’t bad enough, Chris is stunned when Marsha accuses Chris’s deceased mother of trying to ruin the wedding. Certain their mother moved on to the Great Beyond long ago, the Wilson sisters investigate who—or what—is really out to get Marsha. With marriage fever making everyone crazy, can the sisters get to the bottom of this haunting in time to save the wedding? And do they even want to?